← Who doesn’t love a little back story? The Taco Society’s name is inspired by The Chowder Society, an informal club of four men who tell each other scary stories in Peter Straub’s novel Ghost Story. 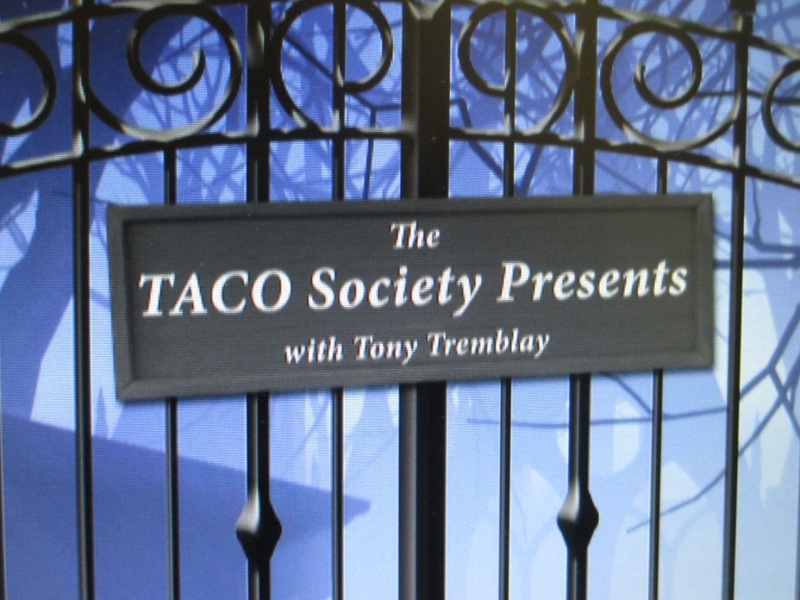 Taco Society members are writers Philip Perron, Tony Tremblay, Gardner Goldsmith, and Sydney Leigh. I hadn’t been on television in a decade–my first experience wasn’t really a good one. This time, I had a total blast, and would do it again in a heart beat! If you’d like to check it out, you can watch our Episode, Episode 12, here, which also features an interview with teen writer Emily K. Murphy. If you’d like to read all about what it was like to be on TV, Stacey’s got a great post about it…and below are some photos. Mirror shot! Stacey and I ready to leave our Manchester, NH hotel to head over to Goffstown for the taping of an episode of The Taco Society Presents! The studio where The Taco Society Presents! is taped is at Goffstown Area High School in Goffstown, New Hampshire. The studio is set up for the show. Notice the green — this is so that the studio can drop in any computer-generated backdrop it wants. This saves money, as full sets for several shows would be both space- and cost-prohibitive. It’s really a pretty neat set up. Writer and Taco Society member Gardner Goldsmith gives the thumbs up to get things rolling. Selfie! Stacey and Sydney. Photo by Sydney Leigh. Writer and Taco Society members Tony Tremblay (left) and Sydney Leigh (right) prepare to interview writer Stacey Longo. Tony, Stacey, and Sydney clowning around before taping begins. Photo by Philip Perron. Stacey (center) is interviewed by Tony (left) and Sydney (right). The backdrop is in place of the green wall. Gardner takes a shot at some of the rest of the crew getting settled in the studio. Stacey talks the trade. Photo by Philip Perron. Engineer David Kimball is responsible for taping and editing. Tony (left) and Sydney (right) prepare to interview Stacey in the studio. They close the door during taping; I was lucky enough to grab this shot. Sydney is ready to go! Stacey models her festive Halloween nails, courtesy of Sydney. A close-up of Stacey’s awesome nail appliques (provided by Sydney). I would’ve loved to have put them on, but my nails, by nature, are a trainwreck (between writing and sticking my hands in The Maritime Aquarium at Norwalk’s touch tanks all the time — and you can’t wear nail polish there anyway — there isn’t a point). Chillin’ in the Green Room. Photo by Philip Perron. Getting ready to tape! Photo by Sydney Leigh. Selfie! Photo by Sydney Leigh. Me and Sydney before taping. (Honestly, there really is just water in that cup! I always have to have water during an interview). Photo by Philip Perron. Me, Philip, and Sydney on the air. This is the view from the Green Room monitor. Photo by Stacey Longo Harris. Another shot from the Green Room monitor. Photo by Stacey Longo Harris. Me, reading from BAD APPLE. Photo by Stacey Longo Harris. From left, Tony, writer Emily K. Murphy–author of the Kissimmee’s Newport series of children’s books–and Gardner pose before taping their segment. Photo by Philip Perron. The four members of The Taco Society tape their bump-out. Phil thought the show went well! Gardner struts his stuff! The T-shirt was a gift from Sydney. At the end of the evening, a vacant studio. Photo by Philip Perron. This is supposed to say Shorty’s — the restaurant we headed to after taping (because after all that excitement — just like after a live stage performance — you’re all wound up and need to chill a bit). I just thought the dark ‘t’ was funny. Did you think with a name called The Taco Society we WEREN’T going to hit a taco joint? Seriously, Sydney’s burrito is the size of a small baby. Oh, yeah…I had to go with the shrimp fajita! Sydney, champion of the cocktail sword fight…well, go where you want with that. Me at Airport Diner in Manchester, NH, the day after filming. Photo by Stacey Longo. Posted on October 6, 2015, in Bad Apple, News, The Writing Life and tagged Bad Apple by Kristi Petersen Schoonover, Gardner Goldsmith, Goffstown NH, how to write, Ordinary Boy, Philip Perron, Stacey Longo, Sydney Leigh, Taco Society, Tony Tremblay, writing groups, writing television shows. Bookmark the permalink. 1 Comment.